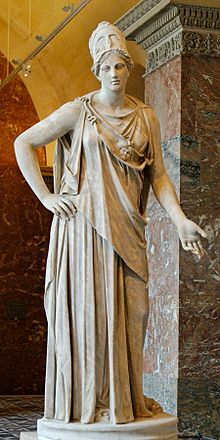 Mattei Athena at the Louvre, Paris. Classical Roman copy from a 4th-century BCE Greek original. Via Wikipedia Commons. 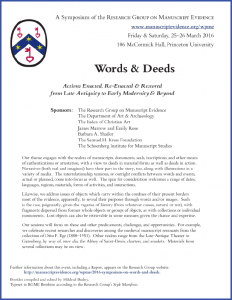 Often, from the 1993 Congress onward, the Research Group on Manuscript Evidence participates in the International Congress on Medieval Studies (ICMS) held annually at Western Michigan University, Kalamazoo. The Research Group activities at the Congress take myriad forms. Usually, now, we sponsor and co-sponsor Sessions with Papers, Responses, or a Panel Discussion. Sometimes the Session includes a Display of original manuscript and related materials. 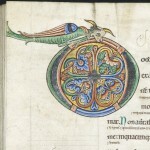 Occasionally we have provided a Photographic Exhibition of manuscript images and commentary. Some years call for special celebrations, with a Party or Reception, as with our Special Anniversary Year of 2014. Our practice also includes Trustees’ Meetings or Business Meetings, as appropriate; since 2015, our Open Business Meetings are listed in the Congress Schedule, with an assigned room and provided refreshments. The concise Agendas for these Meetings, which report on one page our activities, accomplishments, prospects, requirements, and vision, continue to be downloaded regularly from this website (so far for 2015 and 2016). Our Congress Archive reports our Congress Activities for each year. Among them are Sponsored Sessions and Co-Sponsored Sessions, highlighting the different organizations in their own right. These concerted activities did not arise, unlike Athena, fully formed. 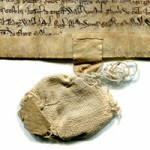 They took years of preparations, both in the development of an integrated approach to manuscript studies, and in the cultivation of fields of expertise, experts, scholars, students, and others interested in the study and promotion of better understanding the transmission of written materials through the ages. Some of this spadework occurred at the International Congress on Medieval Studies. We review its highlights here. In our Series on “The Evidence of Manuscripts”, this Workshop (also called a Visit) followed our larger Workshop or Seminar on “Image-Processing and Manuscript Studies” on 15 January, but it resulted from its own set of extended preparations by another Project, likewise funded by The Leverhulme Trust. For this purpose, members of that project, based at University College London, brought some portable scientific equipment for close observation of selected details involving red pigment in a few Insular and Anglo-Saxon manuscripts. 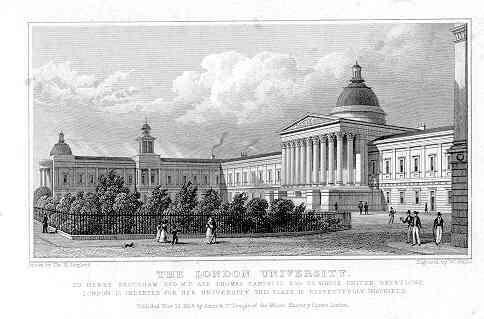 ‘The London University’ (now University College London) as viewed by Thomas Hosmer Shepherd (published in 1827/280), via Wikipedia Commons. The subject of the Visit to the Parker Library: Non-destructive analysis of “Pigments in Selected Corpus Manuscripts” by UltraViolet-visible spectroscopy. 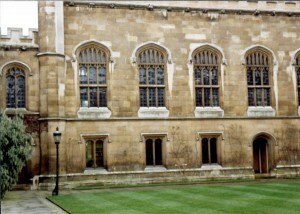 (Parker Library, 24 June 1994). This seminar was “devoted to medieval manuscript fragments at the Parker Library and elsewhere, in both public and private collections.” As usual, the existence of manuscripts in other collections relevant to the theme under consideration was taken into account, but now, thanks to their collector, our Associate Toshiyuki Takamiya, some of those manuscripts came to the Library for Seminar to see and to compare. Focused on the evidence and challenges of medieval manuscripts from Canterbury, this was the last Seminar in the Series on “The Evidence of Manuscripts” organized by the Research Group on Manuscript Evidence while the Group was still resident at The Parker Library of Corpus Christi College, Cambridge. September was the last month of the 5-year Leverhulme Trust Research Project based at the Library, with a team of specialists; the term of the Project extended from 1 October 1989 to 30 September 1994. 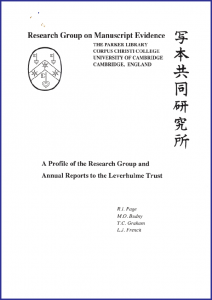 The course and subjects of its research work are described in the detailed Annual Reports to the Leverhulme Trust. As described among our Publications, the Reports were reprinted and circulated, together with the current Profile (updated as appropriate) of the Research Group on Manuscript Evidence. 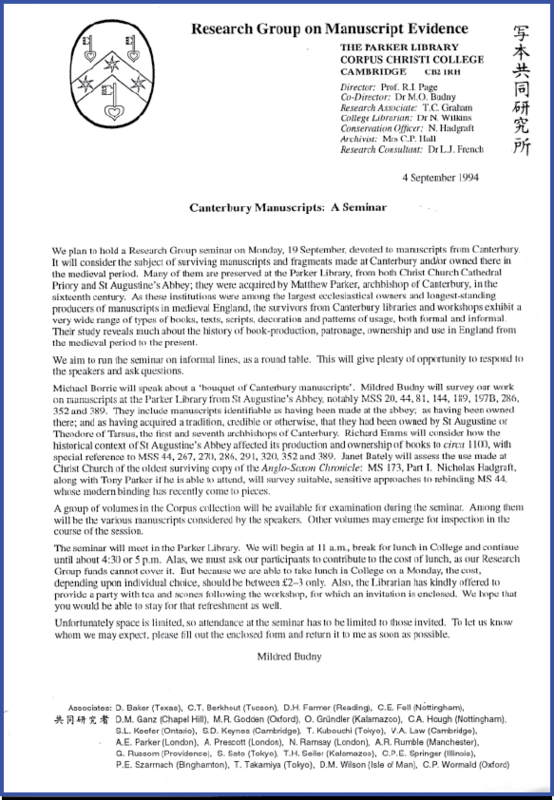 The specialist research work at the Library had, however, officially begun with the 2-year appointment (1987–1989) of an outside-funded full-time Senior Research Associate (Mildred Budny), dedicated to research on Anglo-Saxon and related manuscripts — emanating naturally from her comprehensive Ph.D. study of the Royal Bible of Saint Augustine’s Abbey, Canterbury, and applying its holistic methodology to relevant (as well as other) manuscripts at the Parker Library, including those undergoing conservation. Observing the value of such integrated dedication, photography included, to the study of manuscripts archaeologically revealed in disbinding and rebinding, the Librarian and the Senior Research Associate determined to apply to the Leverhulme Trust for outside funding both to continue and to extend this work, next with the full-time employment also of a Research Assistant (to be identified), as well as more photography of the unfolding evidence. 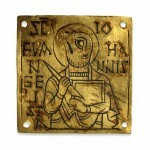 The first Seminar in the Series of Seminars on “The Evidence of Manuscripts” took place several months before the Leverhulme Trust Research Project began, and considered “Manuscript Illustrations as Evidence for Anglo-Saxon Life”. 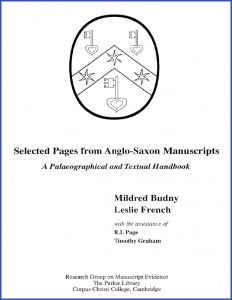 This seminar demonstrated the current state of The Palaeographical and Textual Handbook, in course of preparation as a teaching text for manuscript studies. Invitation in pdf here. Note the addition of the sign of an opened pair of scissors to cue the motion for separating the RSVP slip from the single-page Invitation Letter. 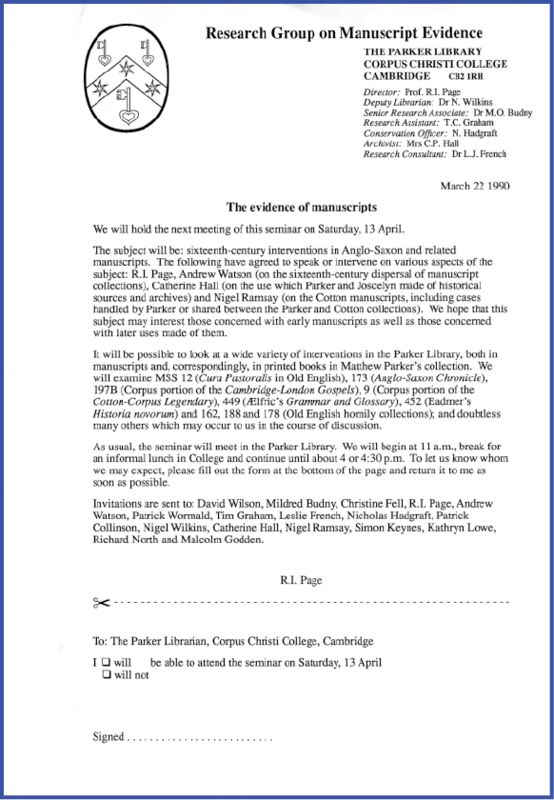 The sign represents part of the evolution of the form for the Invitation Letters of the Series. 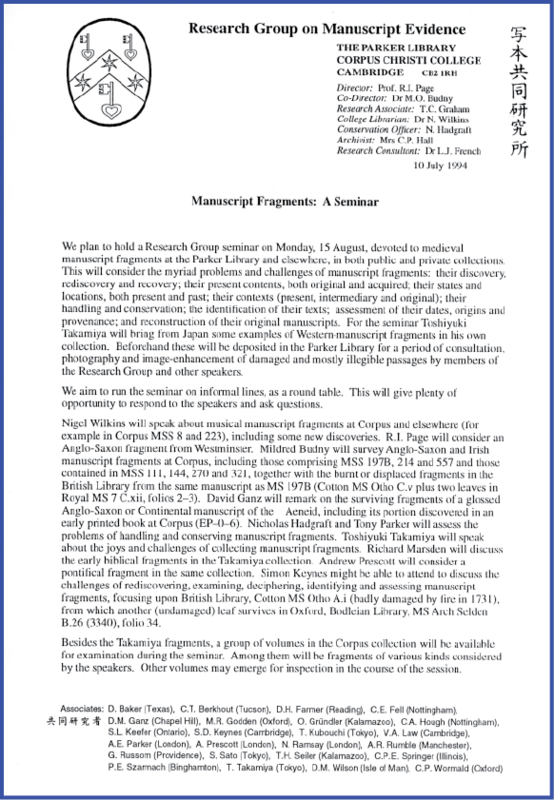 The seminar presented the work in progress at the Library on a series of sample facsimiles of pages from early medieval manuscripts, with transcriptions and commentaries, to teach postgraduate students the elements of manuscript study. We began with an account of its aims, with a demonstration of the range of representations of the selected pages or facing pages. The series proceed from photographic facsimile of the original at original size (with scale and colour guide), through computerised representation of the layout of the texts upon its page(s), to transcription, edition, and translation, with commentary. 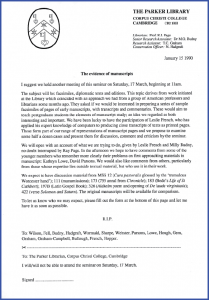 Then we sought “comments from some of the younger members who remember more clearly their problems on first approaching materials in manuscript . . . and from others, particularly from those whose expertise lies outside textual material, but who use it in their work.” The original manuscripts were also available for comparison. David Wilson, Christine Fell, Mildred Budny, Nicholas Hadgraft, Patrick Wormald, Richard Sharpe, Leslie Webster, David Parsons, Kathryn Lowe, Carol Hough, Richard Gem, Timothy Graham, James Graham-Campbell, Donald Bullough, Leslie French, Andy Hopper. 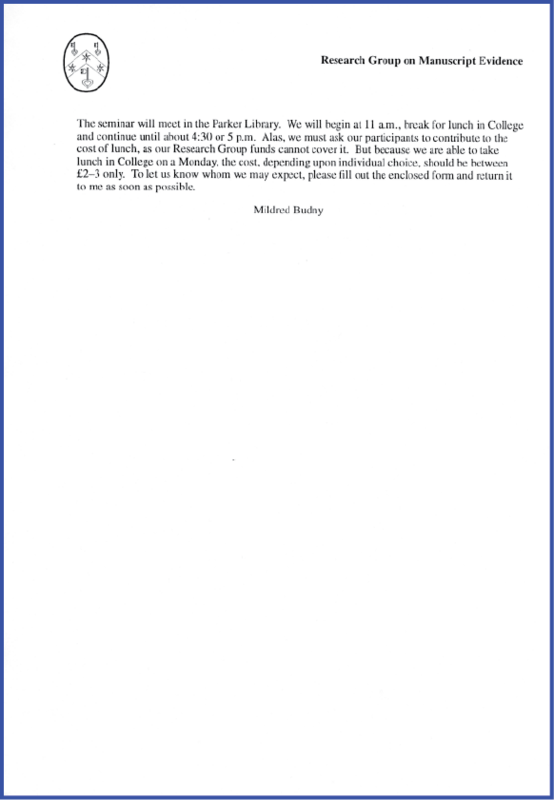 A typescript report of this Meeting of the Seminar was prepared by Mildred Budny. It survives in the Research Group Archives. (Parker Library, 13 April 1990). 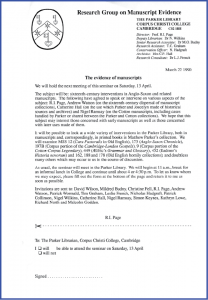 Most of the Seminars on the Evidence of Manuscripts considered manuscripts, types of text, approaches to scripts and layout, and challenges for transcribing, editing, translating, and analysing the evidence upon the pages, chosen for the Handbook, which engaged our collective attention throughout the rest of the Research Project and, to a limited extent, beyond. 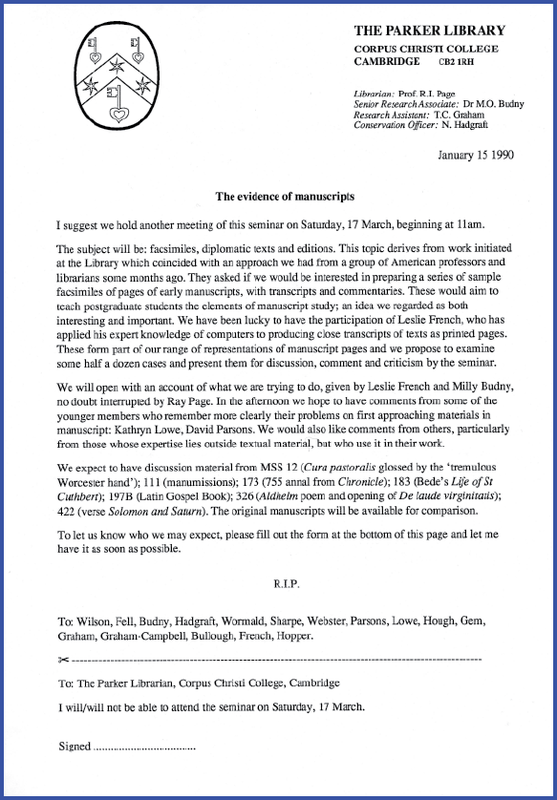 With the requirement at short notice to find a different base for the Research Group on Manuscript Evidence following the completion of the Project, rather than the base that had been contracted, some intended publications fell into disarray for a while. The Handbook was one of them. Now, in digitising and recording more of the Research Group’s records on our website, we can present a clearer representation of the vision of that plan. Watch this space. 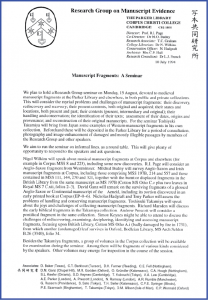 The previous seminar in the series considered Facsimiles, Diplomatic Texts and Editions. 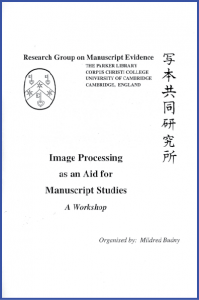 This workshop focused upon optical imaging techniques as aids for manuscript studies. 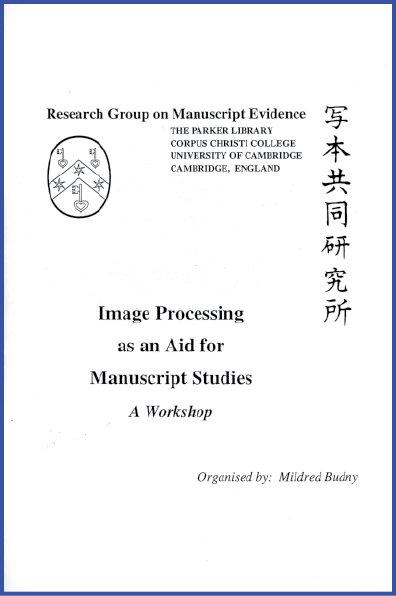 It considered developments in imaging through photographic and computerised methods, as it provided a forum for information and feedback about techniques of image processing, both existing and planned: applications, capabilities, limitations, desiderata, and future potential. Participants included experts in manuscript studies, conservation, photography, imaging aids, computing, radio astronomy, engineering, forensics and medical imaging. A ‘Preliminary Report’ of the proceedings of the Workshop was prepared and printed by the Research Group as a small-format Booklet soon after the event. Following the move of our principal base to the United States later that year, not to the destination expected, but to Princeton, we thought that the Booklet had disappeared. Describing the event for our upgraded website (in October 2015), we had to rely on the corrected proof-copy, transcribed here. More recently, from another section of our Archives, the printed copy of the Booklet has emerged, and we publish it as well in downloadable form. It represents the first of our printed Booklets for any of our events. It followed the model of our Annual Reports for the Research Project, composed principally by Mildred Budny and circulated in printed copies both individually and as a collected group, as described among our Publications). Those reports summarised our Seminars and Workshops, along with accounts of our other activities and the research work itself. 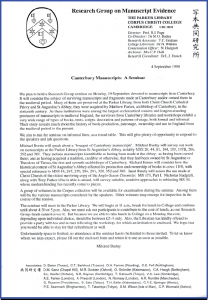 It also followed the model of the Exhibition Booklets for the exhibitions at the Parker Library of “Canterbury at Corpus” (1991) and “Matthew Parker in Cambridge” (1993), although those are illustrated with our photographs from Parker Library materials. 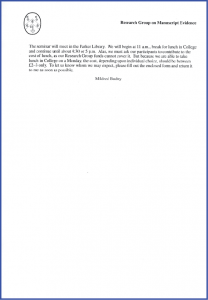 Both were printed in-house and circulated at the events, as well as afterward. 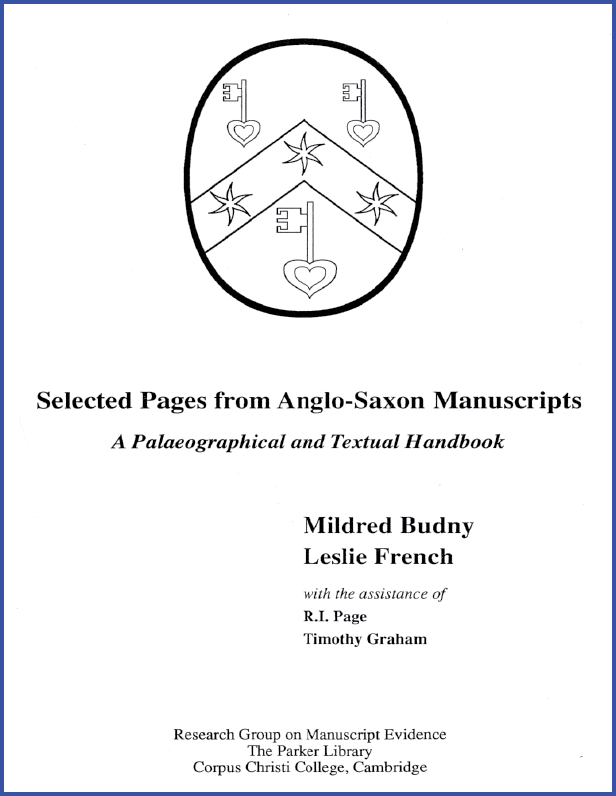 Both were reprinted, but in quarto format, in the Old English Newsletter, 24:4 (Summer 1991), Appendix A (= pages A-1–A-7) and 27:1 (Fall 1993), Apendix A (A-1–A-8); the latter issue is available online in the OEN Archives, but not yet the former. 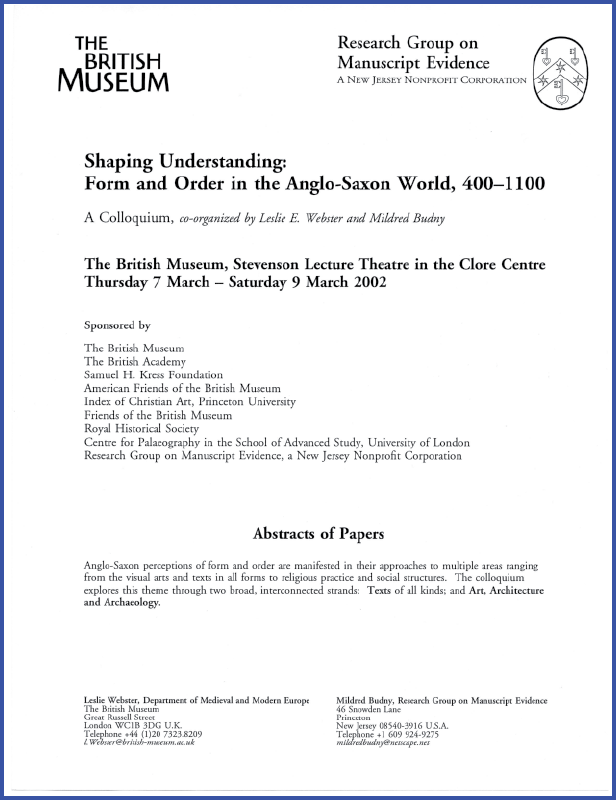 In their original design, these Exhibition Booklets emanated in A3 format as a group of single sheets stapled twice along the left-hand side; the 1991 Exhibition Booklet, with text and photographs by Mildred Budny, was also prepared as an A5 booklet of folded and nested leaves with the pages of text and image reduced to half-size in photocopying. Similar layout in small-format booklets came to pertain also to the Annual Reports. 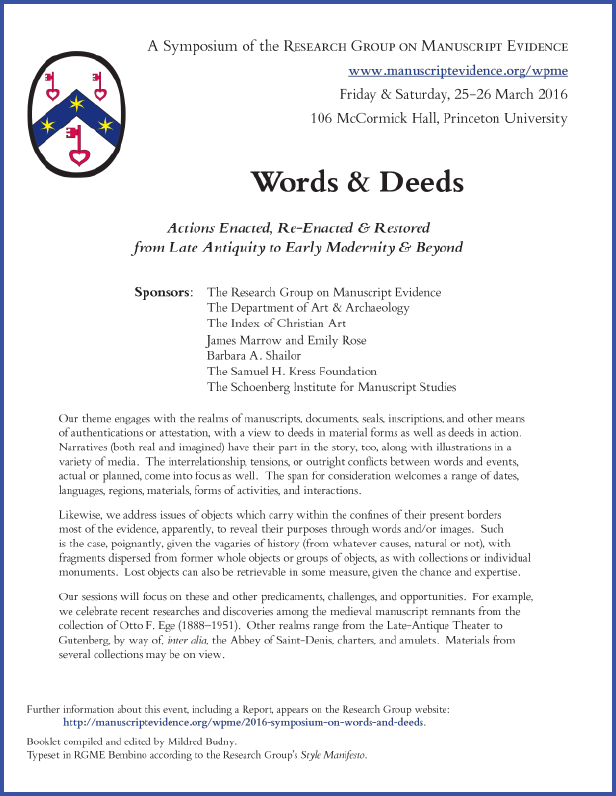 Such forms of in-house design, layout, and publication by the Research Group on Manuscript Evidence prepared precedents, and customs, for the Workshop Booklet. Those folded and unstapled booklets comprise either a double-sided 4-page unit (1 quarto sheet folded in half as a bifolium) or a menu-like tryptich (1 legal-size sheet folded in three) with wings to open and close at will. Each case was issued in printed form at the event and circulated afterward also in printed form. In this respect, the Symposium Booklets differ from the 1994 Imaging Seminar Report, which emerged after the event — indeed like the Annual Reports of our events overall (1990–1994). The 1994 “Preliminary Report” takes the form of 6 double-sided sheets folded into 12 pages as a small-format booklet (A5), although it also circulated as full-page sheets (A3). 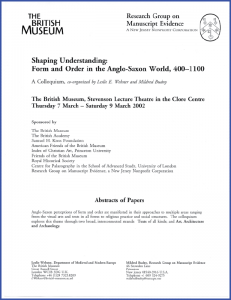 A longer booklet accompanied our 2002 Colloquium at the British Museum. That case stands within The New Series of our Seminars, Workshops, Colloquia & Symposia. Within the New Series, the Booklets have become a regular, but not necessarily invariable, feature, while illustrations enter their pages more and more, through generous donations of images for the purposes. Our experience in designing, laying out, and typesetting our Illustrated Bulletin ShelfLife (2006–) prepared the way for the illustrated Booklets as a way of life. Each case was issued in printed form at the event and circulated afterward also in printed form, until we acquired a website and the site could accommodate them. Our tradition is to “launch” the publication of the booklet in its printed form at the event itself. Then we may post it on the website and circulate it elsewhere. See also our list of Publications. The “Imaging” Booklet joins their company.